Capt. 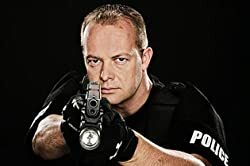 Huth has written a book, is writing another, has a TED talk, and has at least real world tactical and leadership experience. His is a worthwhile viewpoint, shared by others, yet one which bears deeper analysis. I completely disagree with Capt Huth’s statement that police culture takes the warrior metaphor overly seriously. The fact of the matter is law enforcement doesn’t take it seriously enough. Our Constitution, our Courts, and our society have underscored and reminded police officers that they “are not at war with our own people.” This is the only way it can be in a modern democratic society. But as we continue to see over and again, some of our people are at war within their own communities – Chicago being a prime example. And some are very much at war with our society, and choose to attack innocents simply going about their daily lives on our soil. Still others, twisted by ideology or their own fevered minds or simply by happenstance or circumstance, have declared war on the police. In each case, it is police officers that are the first responders, the front line, and the specific targets of that violence. Such as when a man with grandiose delusions walked into a Lakewood, Washington coffee shop and murdered four police officers at coffee, certainly at war with the police. There have been numerous examples since, Dallas being the starkest example. Men clearly at war with police. Or when an active shooter approached a Sikh Temple, or entered that African American church and though he was invited to pray with them instead ambushed and murdered the congregants, were they not at war? (racial war? holy war? racial holy war?). The shooter that entered the gay nightclub in Florida and began a horrific slaughter; The husband-and-wife team in San Bernardino; Or the man at Ohio State. Were they not at war? Perhaps not only with innocent people enjoying the freedoms our country and society offers for them to be themselves, but perhaps with themselves? When gang members spray bullets down their neighborhood streets full of children, or into gatherings at street corners or in cars or parties in disputes over territory or perceived disrespect, are they not turning their neighborhood into a war zone? Or, finally, those at war with their own families, brutalizing and dehumanizing them over years, deciding to ambush responding officers but responding to a call for help – because they are the only ones who ever actually do anything, or represent any real consequences for the perpetrators of such acts: not the courts or the counselors or often even the victims. These officers enter a battlefield not of their creation or choosing. Who exactly do we want to respond to these incidents? What kind of person? Who do we want training our young new officers to respond to them? Who do you, mother and father, want sitting in the car next to your daughter or son as they begin careers as police officers, training them and advising them on how to do the job? What kind of officer do you want teaching them the ropes and how to be safe? Those aspiring to the warrior metaphor must come the understand that the Warrior Ethos is a Way of Life. That means constant, career-long training in physical and technical skills; constant study of investigative, officer safety, and operational tactics; of tactical communication and de-escalation from a posture of confidence and competence in the full spectrum of enforcement, not based on lack of these very things and fear of liability and public perception. And as Capt Huth rightly calls to attention, the very idea that a police union could in any way ever argue against physical fitness standards for their membership. Though we all know this is a reality. This is true, perhaps not necessarily of the oldest literature but certainly a nascent concept of it was there. Tactical performance at the highest levels has been linked to composure and character for a long time in sources from both East and West, classical and modern. The warrior metaphor calls for responsibility and accountability to a Warrior Ethos on the part of all: the public, police executives, law enforcement unions and individual police officers. This is so obviously the path that needs followed, yet is so poorly understood or inculcated within the ranks of law enforcement that its executives and managers don’t understand and can’t explain it in any meaningful way and its rank and file invoke it as a mantra without doing the work so necessary to make it a reality. It is interesting to read the response to the Huth piece in the latest Force Science update. Many agreed with Huth and others strongly disagreed. Quite a few of those in agreement were academics and high ranked individuals, although not exclusively by any means. Your last paragraph shows a clear path: responsibility, accountability, and much work. I think this is the fundamental discussion at issue with law enforcement today. On the one hand you have (some) academics and executives with a vested interest in changing a narrative. This narrative has varying levels of validity, so there is some traction to be had there. And you have the average officer who has a vested interest in some kind of overarching approach to a career founded in the judicious use of force. That is, at its heart, the most solemn aspect of law enforcement, and one which demands the scrutiny that it is given. I have no problem there. But neither have any interest in dealing with the root of the problem. Training and accountability. There is no standard, there is not even an expectation that our law enforcers be trained in better use of force decision making and application. There is only a demand that they be made more sensitive, more culturally aware, more compassionate. Unfortunately to the human being whose brain is gripped with fear, reasonable or unreasonable fear, those very things go right out the window. At its base, this means far more dollars spent, far more time invested, far greater expectations for trainers and officers, and far more blood, sweat, and tears invested in training programs that sustain an officer’s skills far past the academy, rather than a concentrated six months with no follow up or personal responsibility or accountability to stay in shape, to stay a good shooter, a good fighter, with effective and useful skillsets tested over and over again in decision making scenarios across the spectrum of decision making. The only place this happens, perhaps with the exception of the very last topic, is in the private sector. How does that make sense? With that kind of training, you will see less fear-based reactionary responses and much more conscious and unconscious competence. Which means more confidence. And more composure. Composure that allows for that sensitivity, and compassion, and cultural awareness. “Big LE,” that is, the executives, the union leaders and memberships, and the social justice academics aren’t even having that conversation yet, though it seems it may go that direction. Some of them will fight tooth and nail against it in terms of the kinds of people that get hired, the kinds of training (and the cost) that it will entail, and expectations and accountability it will demand of the average officer.